WHEN: March 19, 2017 at NOON. First Prize is $1000. The First Prize winner will perform a concerto movement at the BONJ Summer Music Festival in August, 2017. Second prize is $500. Third prize is $250. Two $100 honorable mention prizes will be awarded. Judges will include principal musicians from the orchestra and guest artists. The competition is open to instrumentalists ages 16-22. 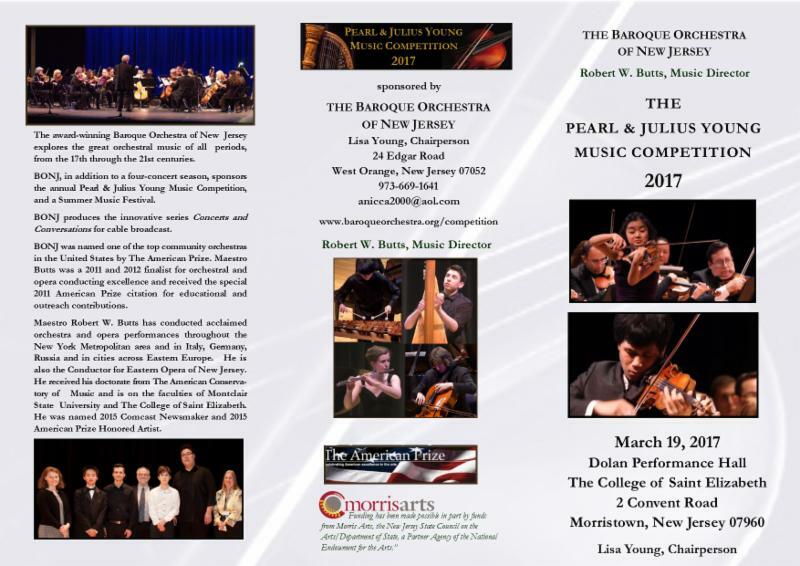 Finalists chosen from the applicants will perform at Dolan Performance Hall, The College of Saint Elizabeth, on Sunday, March 19, 2017, 12:00-3:00 PM. Artists will be able to warm-up starting at 10:00 AM. Finalists may perform with their own pianist or with a pianist provided by the orchestra. Non-keyboard finalists must perform one movement from a concerto from the Baroque, Classical, Romantic or Modern eras. Pianists must perform a movement from a sonata or an equivalent work. Fill out the application and mail with a check for the non-refundable application fee of $25 (payable to BONJ). Include a brief biography or resume, letter of recommendation and a CD, DVD or YouTube Link of you in performance. Applications must be received by January 6, 2017. Finalists will be notified by January 27, 2017. Please mail to: Lisa Young, Chairperson, 24 Edgar Road, West Orange, New Jersey, 07052.